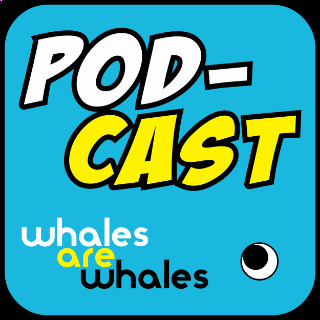 The Whales are Whales Pod-Cast is a weekly gathering of the original creators of the Whales are Whales network. A group of whales is called a "pod," so you get where we're going with this. It's a goofy, lighthearted place for the WaW crew to have unstructured conversations about both things and stuff. It's like an office water cooler hangout, but everything is recorded and published on the internet. Also there's lots of yelling. If you want to keep up with website happenings along with what everyone's been eating for breakfast, this is the place to be. Remember, it's your responsibility as a citizen of Planet Earth to get involved, so click on some of those social media buttons below and we'll have a nice chat!